Are you a business owner? Do you have employees? 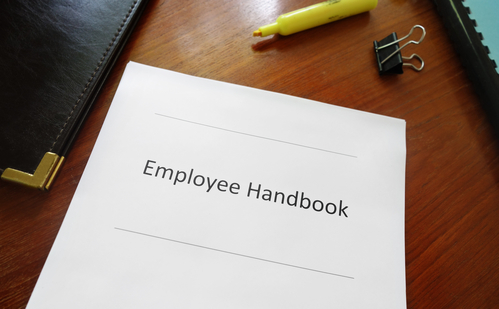 Do you have an Employee Handbook? If you answered yes to the first two questions, but don’t have an Employee Handbook you should read my latest blog post on whether your business needs a Handbook. There is no law requiring employers to have an employee handbook, but it’s a good idea no matter what size your company is. A handbook lets you inform your employees about your workplace rules in an efficient, uniform way. Your employees will know what is expected of them and what they can expect of you. 1. Improved communication with your employees, and insures that every employee receives the same information about the rules of the workplace and employee benefits. 2. Ensures that your employees will know what you expect from them (and what they can expect from you) on a range of issues. 3. Presents the company’s policies on using computers, personal electronic devises (i.e. mobile phones) and other equipment, and restrictions on the use of the company’s confidential information. 4. Provides crucial legal protection in the event an employee files an employment claim against your company. 5. Citing firm policies on benefits, vacations, holidays, etc. Getting started is not as costly as you might fear. We can assist your company in developing appropriate company policies and preparing an Employee Handbook reflecting such policies. For more information on Employee Handbooks, read Top 10 Employee Handbook Mistakes.